Out of the corner of my eye I caught sight of a number of flying objects which immediately reminded me of the movie Apocalypse Now. Just as the helicopters come in over the beach to the stirring sound of the Ride of the Valkeries, the huge stingrays seemed to be homing in on the divers below. Just over an hour earlier, I woke from a deep sleep, rested after a hard day's diving. 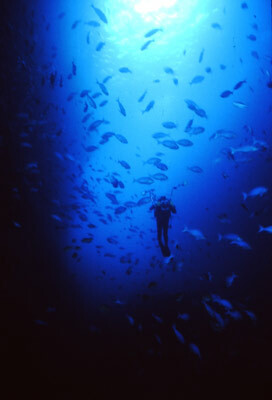 I was on a 19 metre long liveaboard dive vessel in the South Pacific. This was the third day of diving. 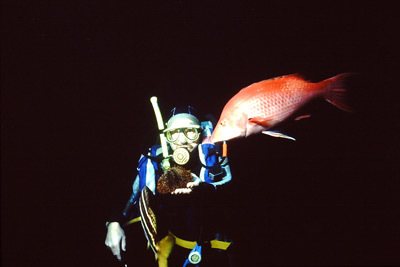 On previous days the water visibility had been a constant 18 to 24 metres. I rolled out of my bunk and walked up on deck to see the sun slowly climb over the horizon. It reflected brilliantly on the almost mirror like water. It was so difficult to believe I was not in New Guinea, the Solomons, Fiji or even Vanuatu, but I was in fact well off the North Island of New Zealand. Yes, New Zealand. Like most of New Zealand's coastline, and virtually all of the east coast of Australia, the Poor Knights Islands, 160 kilometres north of Auckland on the North Island, were first charted by Lieutenant James Cook on his first voyage around the world. On Saturday 25 November 1769 Cook named the group of islands he encountered that day the Poor Knights. Consisting of the two main islands of Tawhiti Rahi and Aorangi as well as The Pinnacles and Sugarloaf Rock to the south, the Poor Knights are the remnants of ancient volcanic action. Jutting up out of the ocean, the islands make a spectacular sight as they are approached by boat. Of course Cook and his crew were not the first people to see the Poor Knights. At the time a large Maori population was resident there. On the surface, the islands appear a barren and bleak place. But below the water's surface, the Poor Knights are alive with colour and life. To the Maori Ngati-wai tribe, the sea around the Poor Knights contained a wealth of food which enabled them to be quite self-sufficient and successful. However, in the early 1800s the islands were raided by another tribe and nearly the entire population was massacred. Since that time the islands have been "tabu" - out of bounds to the Maori nation. The Poor Knights are situated such that they receive the warm sub-tropical current that flows from the upper reaches of the South Pacific Ocean. This warm water means that the islands are home to many species of fish that are normally only found much further north. 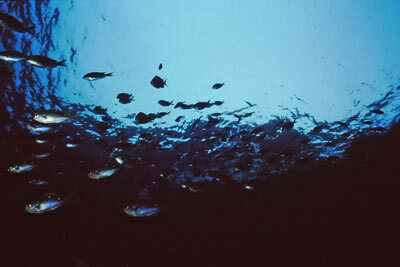 Not only are the fish varied in species, they also occur in vast numbers. In recognition of this fact the whole Poor Knights area was declared as a marine reserve in 1981 and landing "taboo" to all but authorised persons. Fishing, spear fishing and some other activities are regulated in some areas of the reserve. The Poor Knights Chieftain at the entrance of Rikoriko Cave - it can fit inside! The islands have literally hundreds of different dives, but they all have one thing in common. Underwater caverns!! Caves, tunnels, chimneys and arches abound, cut into the softer sections of the igneous rock by the water action. 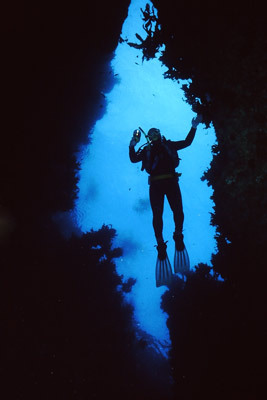 Virtually every dive has at least one of these physical features and most two or even three. 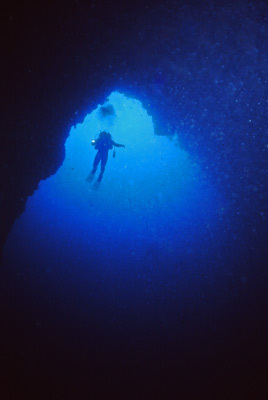 There are at least 11 major archways that start above the water's surface and drop down to depths of up to 45 metres. As can be imagined, this makes a spectacular underwater fiesta. The more spectacular arches include Northern Arch, Middle Arch and Maomao Arch. Caves abound, ranging from ones only big enough for one person to cathedral sized caves that can safely accommodate large cruisers. As well as this, the depth of the sea off the islands drops away very dramatically, with the water being over 100 metres deep only metres from some parts of the islands. These features, combined with the prolific fishlife, combines to ensure extremely spectacular dive locations. 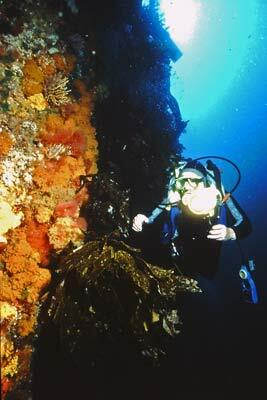 The diving I did at the Poor Knights Islands was the best reef diving I have ever had the pleasure to experience. 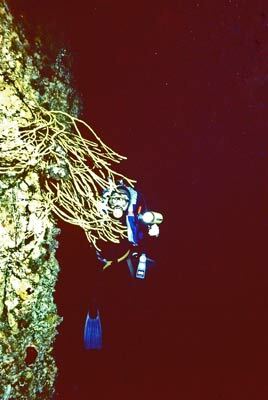 The following is a brief rundown on the better sites to dive from my trip there in 1992. Eight of the dive sites at the Poor Knights are covered in detailed individual pages. Click on this link to see those articles. 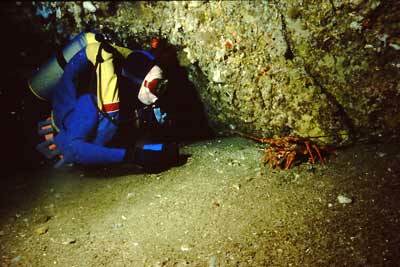 The following are some of the other sites I dived when I visited the Poor Knights back in 1992. A fantastic dive. Taravana Cave consists of a sandy-bottomed h-shaped cave with the largest entrance being at 31 metres. Fifteen metres across and 13 metres high, the cave narrows and the bottom rises up to 29 metres before the main intersection. The bottom part of the h continues around to the right, about 5 metres wide, and deepens to 33 metres. 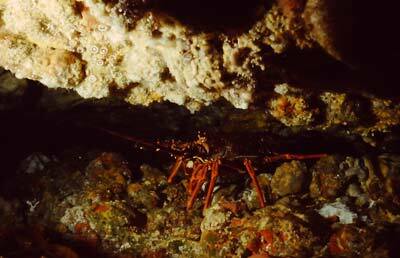 Many large crayfish can be seen on the walls of the cave. 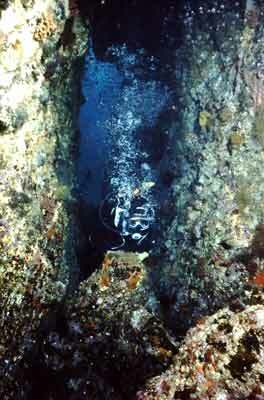 To the immediate south is Maomao Arch and by ascending to the shallow depths you can safely examine it on the same dive. Most of the arch is only 6 or 7 metres deep. It is hard to see how this site gained its name as the arch is anything but barren. However, the name was given to it by Pete Rippon to "discourage other bastards from going there"!! It is located on the eastern side of the north island, Tawhiti Rahi Island. It is towards the northern end of the island. Huge schools of pink and blue maomao and thousands of demoiselles inhabit the archway as well as some red pigfish. The main entrance to the arch is in a small bay and starts at 28 metres and gradually comes up to 8 metres. This is located at the northern most point of Archway Island. This, as can be imagined, has a huge archway through it that is called, unimaginatively, Southern Arch. 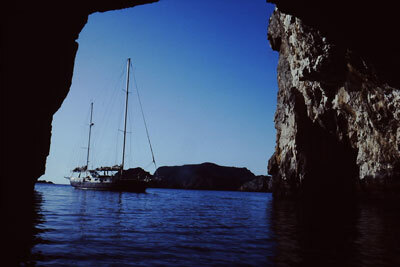 Archway Island is located at the southern end of the main collections of the islands. Blue Maomao Arch is not really a cave but another arch, this is a shallow dive with a maximum depth of only nine metres inside the arch. 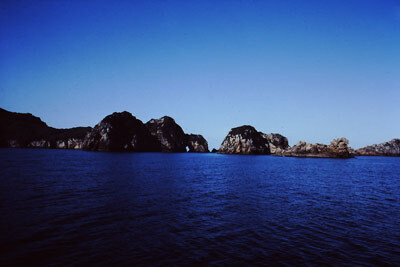 Excellent as a night dive, there are two major entrances and the arch contains thousands of fish, especially blue maomao. The reef you moor on is home to many different species of eel including moasic, conger and moray. Red Baron Cave is located on the western point of the southern island, Aorangi Island. It is just north of Crystal Cave. This site consists of three chimneys that start off a shear wall that bottoms out at 25 to 40 metres deep. 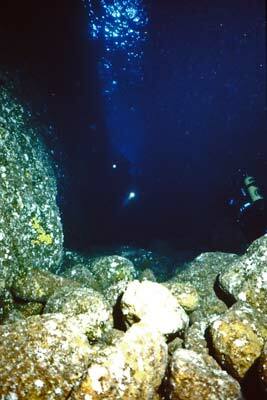 The entrances are between 17 and 20 metres deep and quite large in size. Once inside the chimneys, you can swim up towards the surface. Fish abound in the chimneys providing divers with the opportunity to take quite spectacular photos looking towards the surface. On the north-eastern side of the southern island, Aorangi Island, there is a small cove. 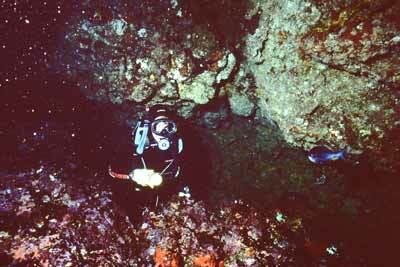 This has two dive sites, Long Cave (also called Matts Crack) and Mine Shaft Cave. 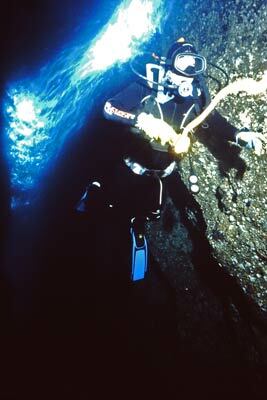 If you have enough bottom time and air, these two sites can be done in the one dive. Long Cave consists of a two to three metre wide eroded volcanic dyke that runs for at least 150 metres back into the island. At the start it is open to the sky but eventually it becomes a cave. The depth goes from 18 metres near the start of the crack up to 7 metres at the end. Mine Shaft Cave, about 100 metres away and 18 metres deep, is really a huge cavern, extending up well above the water level, into which a medium size boat could safely enter. To the south of the main Poor Knights Islands are two other features. One of these is called Sugarloaf and the other is called The Pinnacles. The Pinnacles consist of two small rocky islands. 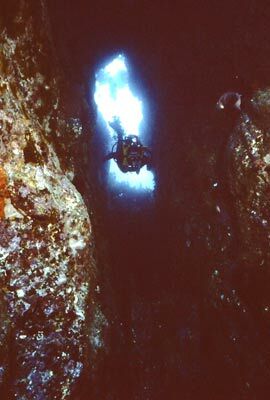 On the smaller and southern one is another great dive site, Tye Dye Arch. This was named in 1970 by American Ken "The Fox" Seybold who thought that the colours of the site reminded him of the then popular tye dye T-shirts. Tye Dye Arch consists of a Y-shaped cave. You enter though the base of the Y at 18 metres and after swimming towards the right hand arch you go under an enormous rock, literally a cave with a cave, to exit outside the arch. After swimming around the arch support you re-enter the other arm of the arch at 24 metres. There are a lot of swim-throughs under the huge boulders in the area just outside the arch. 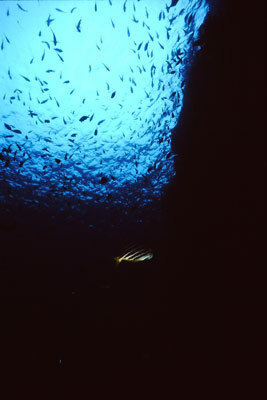 Go back to the main Overseas Page and you can see more information about the Poor Knights Islands. 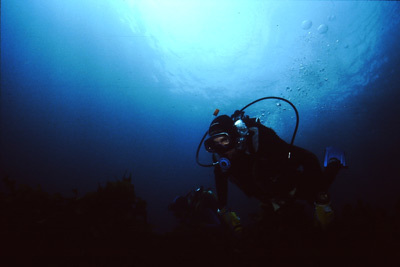 Photos were taken in 1992 using Nikonos IVA on Ektachrome slide film and scanned to digital January 2011. Only minor cleaning of slides using PhotoShop has been done.